Last week, I took a trip up to northern Saskatchewan, to the edge of the boreal forest. It’s an area very close to what locals call the bush. I’d come to camp with family and friends at Emma Lake, but when we arrived we discovered that we were deep inside one of the biggest wildfire outbreaks in years. On many maps, Emma Lake is known simply as a numerical designation. Located near Prince Albert National Park, it’s one of thousands of small, beautiful lakes in Saskatchewan, ringed by forests of pine, poplar, and birch, and inhabited by beavers, muskrats, pelicans and blue herons. It’s a popular vacation spot for people who live in Canada’s prairies, and we had no idea this would be anything other than a lazy week of drinking and boating until we passed a sign on the highway that warned of road closures and evacuations. But the areas affected were far north of our destination, so we kept going. When we awoke in our bunk beds the next morning, it smelled like the neighbors had started an early-morning campfire right outside the window. But that was no campfire. The entire lake area was shrouded in dense smoke, as thick as fog and the color of an old bruise. We couldn’t even see across the dirt road next to our cabin. Fed by drought-crisped foliage, hundreds of wildfires had broken out across Saskatchewan and Alberta, and the smoke was spreading across the entire province. We drank coffee and tried desperately to get news over the slow internet connection in the cabin. 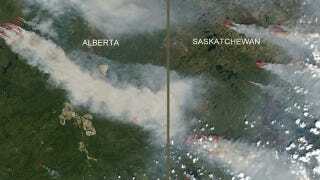 At last, we were able to load a satellite photo that showed enormously long arms of smoke reaching across Saskatechewan. Somehow it seemed more real that way, even though our burning eyes and lungs had confirmed it hours before. Evacuations were only happening much further north, so we decided we’d get our damn lake vacation even if the weather was weird. Hell, it was better than last year, when there were clouds of mosquitoes instead of billowing ash. (Not that there weren’t any mosquitoes — but at least you could stop them with some liberally-applied DEET.) Our lovely host Carmen, whose cabin we occupied for the week, took us out on her boat for an excursion. We even brought boxer puppy George, nicely suited up in his orange doggie life vest. The lake was eerie and quiet, a gray-brown haze fuzzing out the trees and reeds. It felt like we were in an early 1980s John Carpenter flick, where any minute we might be confronted with some ancient lake monster, or giant beaver ghosts. Drought had lowered the water levels dramatically from last year, and Carmen had to steer carefully, using the boat’s depth sensor to keep us out of shallow areas that would wreck the propeller. Finally we reached Fairy Island, a tiny strip of land known mostly as the home of wilderness painter Ernest Lindner, who had squatted there (somewhat illegally) in a cabin during the 1930s. Eventually, the province gave him leave to stay, and his abandoned, boarded-up home is still there — fittingly, it’s become a favorite spot for squatters and partiers. We tromped around in the cool, dim light, looking at the old cabin and trying to imagine what it was like for Lindner, trying to live here and get by on his art during the Depression. That was when we saw the thick plume of dark smoke rising out of the trees nearby. Neil and Jesse went to investigate with George the dog, and discovered the remains of a party from the night before. Somebody had dug a hole in the ground, put a few rocks inside, and lit a fire. They’d left a mosquito zapper and a bunch of spilled popcorn behind — and an ember-filled pit, surrounded by now-hot ground. The fire had spread to buried roots and was eating through the dry moss ringing the pit. Though it sounds counter-intuitive, many wildfires start underground. We knew, just from feeling the temperature of the forest floor and seeing a few puffs of smoke emerging from the moss, that this was a disaster waiting to happen. So we grabbed some bail-out cups from the boat and began running back and forth from the lake with pathetically tiny amounts of water. Eventually, our friend Dianna took matters into her own hands and broke into Lindner’s cabin, fishing two big, plastic tubs out of the piles of debris inside. Neil, Jesse and I created a bizarre fire brigade, pushing through the reeds to scoop up water, then splashing our loads on the hot ground inside the pit. Carmen called the local park ranger station to report the fire. “I know you’re kind of busy up north with fires, but we really wanted to report this because we think it’s burning underground.” I could hear snatches of Carmen’s conversation as I trekked back up to the pit between water runs. She chatted with various local officials, trying different names to explain our location. “We’re at Murray Point, on Lindner Island or Fairy Island — it’s a local landmark. Next to Ernest Lindner’s cabin?” There are so many islands and lakes in the area that even the rangers weren’t quite sure of our location. And so we spent the next hour trekking back and forth with our tubs and cups, tripping over sticks and rocks, checking the temperature of the ground and looking for smoking roots. George the dog was ecstatic that we’d finally decided to play his favorite “go to the water repeatedly” game, complete with lots of digging and sticks. Finally, the ground was muddy and cold, and the only smoke left was what was already in the air all around us, from the conflagrations up north. And that was how Dianna, Neil, Carmen, Jesse, George (the dog) and I saved Fairy Island, Ernest Lindner’s historic squat, and probably all of Saskatchewan. It’s a pretty humble story of adventure, I’ll admit, but it’s also a very real harbinger of things to come. North America is undergoing a historic drought. Though the parched lands of California are grabbing headlines, the entire west coast is drying out, all the way up to British Columbia — as is the continent’s midwestern Great Basin, a major source of food for Canada, the US and the world. One of the predictable outcomes of this environmental change is that we’ll be dealing incredibly fierce fire seasons. Firefighters will be spread so thin that it just won’t be possible to find and put out all the fires. “Widespread smoke” may become a common weather condition in the summer months. Acrid haze blanketed Emma Lake many of the days we were there, but it blew off sometimes too. On one particularly clear day, we went back to Fairy Island to make sure the fire hadn’t started smoldering again. Overhead the sky was clear, but to the east we could see a bulbous yellow cloud obscuring the horizon like a slow-motion nuclear apocalypse. Our fire was still quenched. But the firefighting in this part of the world has only just begun.